Solar Water Pumps (SWP) are becoming lucrative medium to be used for irrigation in India than traditional grid connected pumps and diesel pumps. Though, high capital cost of solar water pump in comparison to diesel and electric pumps has restricted its penetration in India, but with declining solar panel cost (accounting for 40%-45% of entire system) the demand for these would increase in the coming years. According to 6Wresearch, India Solar Water Pumping System Market is projected to grow at a CAGR of 18.7% during FY 2017-22. The Ministry of New and Renewable Energy (MNRE) has set an ambitious target to install at least 10 lakhs solar water pumping systems in various states for irrigation and drinking requirements by 2020-21. Medium power (3.1 to 10 HP) AC submersible solar water pumps are most widely installed in the country, where majority of pumps are used for lift irrigation. In terms of Solar water pump market size in India, the Northern region accounted for the largest revenue in the country in the year 2015-16, followed by Southern region. Rajasthan leads the market in terms of solar pump installations. During 2016-22, the western region is expected to witness large number of solar water pump installations. Additionally, declining solar water pump price would further accelerate the growth of the market. The report thoroughly covers the market by solar water pump market size in India by power ratings, design, drive, applications and regions. The report provides the unbiased and detailed analysis of the on-going trends, opportunities/high growth areas, market drivers, and solar water pump price trend, which would help the stakeholders to device and align their market strategies according to the current and future market dynamics. 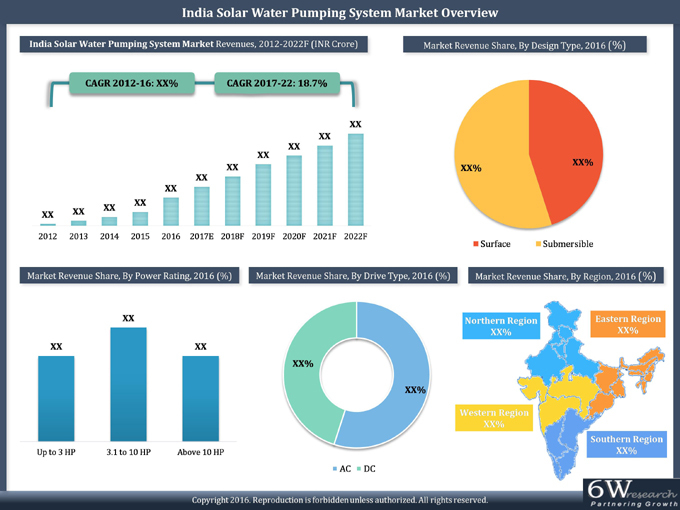 • Historical data of India solar water pumping system market revenues & volume for the period 2012-2016. • Market Size & Forecast of India Solar Water Pumping System Market Revenues & Volume until 2022. • Market Size & Forecast of India Solar Water Pumping System Market Revenues & Volume by Design Type until 2022.
by Drive Type until 2022. • Market Size & Forecast of India Solar Water Pumping System Market Revenue by Application until 2022. • Solar Water Pump Price Trends. 14.2	Bright Solar Pvt. Ltd.
14.3	Claro Energy Pvt. Ltd.
14.4	Jain Irrigation Systems Ltd.
14.6	Lubi Solar Pvt. Ltd.